The Slight Edge is by far the best book I have ever read (so good that I just read it for the 5th time). It literally is the handbook to success regardless of the endeavor. It is a philosophy that has and will stand the test of time. This is the “Holy Grail,” if there ever was such a thing. Below is a diagram that Jeff Olson, the author, created that beautifully captures the entire philosophy. The Slight Edge is about leveraging the power of compound effort. It works in finance just as well as it works in fitness or relationships or business. The Slight Edge works for you when you practice simple disciplines consistently over time. And it works against you when you make simple errors in judgment consistently over time. The reality is that you are either moving closer or further away from “Success” based on the small decisions that seem so insignificant in the moment. What are the slight edge activities that you should be practicing on a consistent basis to accomplish your goals? There is no arguing that there are certain activities that need to be done consistently to achieve success in any endeavor. Take fitness for example, if you want to get in the best shape of your life, you need to work out 4-6 days a week and eat well. It is true, that hamburger is not going to kill you, but overtime if you choose enough hamburgers over nutrient dense salads with lean protein, it will kill your fitness. Find the 2-3 activities that will lead you to success in any activity you pursue and the slight edge will get you there, if you practice them consistently over time. When it comes to your finances and planning for retirement one simple discipline could be putting away enough money into your 401K to max it out every year. Another simple discipline could be paying extra principal on your mortgage to pay it off early. Its little things like this that are just as easy not to do as they are TO DO! And now a trip down memory lane. 2011 was the very first time I read this book and it had and continues to have a profound impact on my life. Wow! I don’t know if it is just me, but 2011 really just flew by. There is only 9 days left of 2011 before we get a chance at a fresh beginning. With a new year come NEW GOALS to CONQUER and many MEMORIES to be made. But before we get ahead of ourselves don’t forget to reflect back on 2011 and acknowledge the huge accomplishments and life changes YOU WORKED so hard to ACHIEVE. It is so easy to let AMBITION blind us from acknowledging everything we accomplished. Take a step back and give yourself a pat on the back and allow yourself to be INSPIRED by what seemed like a pipe dream just a year earlier. Be AMAZED at what HARD WORK and DETERMINATION can do in helping you REACH your goals. I found my Health and Fitness and went through a huge body transformation. I started 2011 weighing 42 lbs heavier than when I graduated college just three years earlier. I hit a tipping point after seeing the scale read 240lbs and 28% body fat…In May I made the commitment to do P90X and the snowball began…I kept pushing play for a full 90 days of P90X, then I committed to Insanity…Now I am just finishing up my P90X/Insanity Hybrid…Its now December and I am at 198 lbs with 12.5% body fat and am in the best shape of my life. The best part is that it’s only the beginning. I increased my annual income by 30% in 2011 vs what I started 2010 with. I got 12 months closer to calling Jenny my WIFE (getting married 2-24-12). I can’t wait to have the honor of calling her my wife. Jenny and I got to move to Newport Beach and get rid of our daily 3-4 hour commute. Although Jenny works a mile from home 3 days a week…she still commutes to San Diego twice a week (still an improvement). I appreciate her sacrifice and need to show her more often. I look forward to the day when the only time we are commuting anywhere is because we WANT to not because we HAVE to. Jenny and I started our own Fitness business by becoming Beachbody Coaches. Sharing Health and Fitness is such an AWESOME gift. Mission Statement: “To help people Achieve their goals to live healthy, fulfilling lives,” how could you not want to be a part of that? If this year has taught me anything it is that CONSISTENT HARD WORK over TIME will result in being SUCCESSFUL in ACHIEVING YOUR GOALS. This is known as the Slight Edge effect. If you have not read the book “The Slight Edge” by Jeff Olson, you need to go to Amazon and order it now. It will change your life. If I had to summarize it I would say that the Power of Compounding is in effect in all aspects of our life, not just our finances. Einstein once declared that compound interest is the most powerful force in the universe. I would re-state that and say that the power of compounding itself is the most powerful force in the universe. I leave you with a challenge to go out and set your goals for 2015 (it is not too late, we still have 11 months left)…and put down goals that will challenge and force you out of your comfort zone (that is where the magic happens). You will be surprised what the power of compounding can do for you and how applicable it is in all aspects of your life. 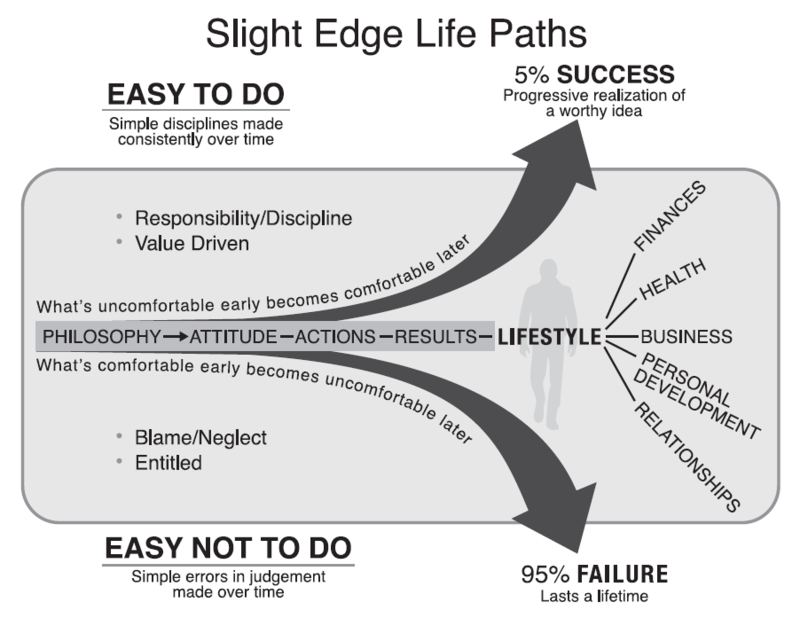 Jef – The Slight Edge is my all time favorite book to date. I have not re-read it this year yeet, but I will. Regarding a prize for getting through the entire backlog of posts? How about I make you a deal?